The Pro Indoor Cycling Bike is by far Sunny Health & Fitness' most popular model, offering a nice amount of features for a very affordable sub $300 price. if you are in the market for a basic trainer that's easy to use and won't break the bank, this one may just be for you. 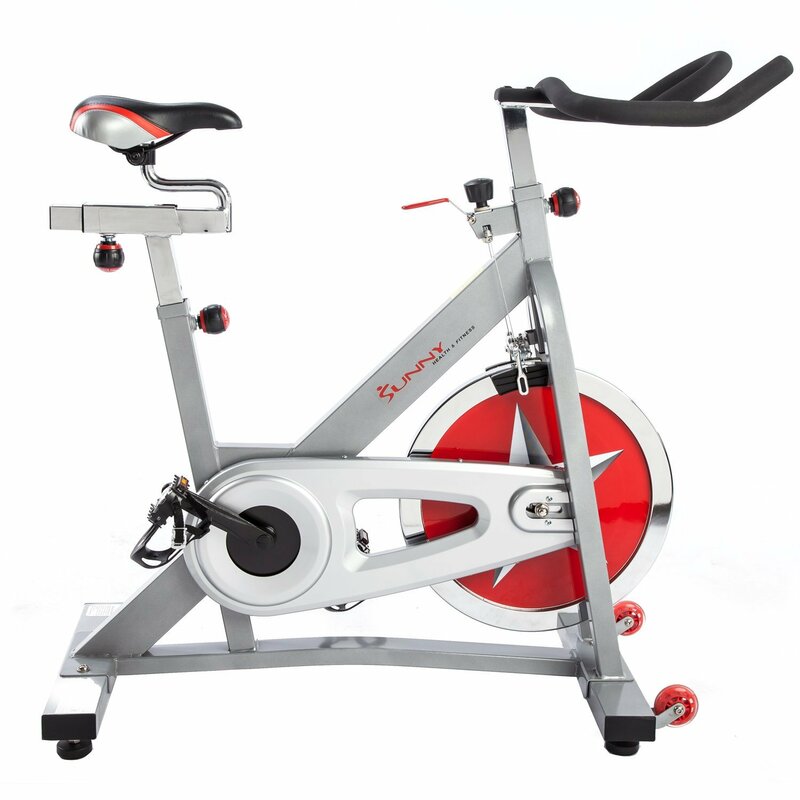 The Sunny spin bike has a heavy-duty steel frame and can be adjusted to fit your needs. It has a chain drive resistance system and is much quieter than it appears to be. Check out the popular Pro Indoor Bike on sale now at Amazon! The reviews on the Sunny Health & Fitness Pro Indoor Cycling Bike have been very favorable. It is currently available for sale at Amazon, where it has received 4 out of 5 stars from over 2300 users. That's about as good as it gets, especially for such an inexpensive exercise bike. You get a heavy 40 lb flywheel which makes the motion smooth and quiet. You can adjust your resistance levels, as well as the seat up, down and back and forth, and the handlebars up and down. The Sunny spin bike bike comes with toe clips and a strap but you can add your own bike pedals to it if you prefer. Most reviews highlight the fact that this is a great price for what you get. There are no bells and whistles, e.g. there is no display showing you your workout metrics or a bottle holder, but it is a solid bike that gives you what you need for a good workout. The solid flywheel gives it a sturdy, gym-like feel, and the turn-knob gives you plenty of easy to adjust resistance levels. All in all, this is a very good bike for the price, and if you need something simple and reliable, this is a great choice. How Does the Pro Indoor Cycling Bike Compare to the Other Sunny Models? Sunny Health & Fitness has really gained in popularity over the last few years, and it seems like they are adding new models to the mix every few months. If you check out the company website they list a whopping 28 indoor cycling bikes, and that's on top of the cycle, desk, fan, recumbent and upright bikes that they carry. That's a lot of inventory! As you go through the extensive list, you'll notice that the models differ in a few main categories: drive system, flywheel weight, max user weight and dimensions. There is also pedal style and handlebar variation. So how does the Pro Indoor Cycling Bike compare to the others? For starters, the list prices range from $249 to $1499, so the Pro Trainer is on the lower end, but more advanced than the cheapest models. You get a 40 lb. flywheel, which is on the higher side of the 30 lb. to 49 lb. range. It has a max user weight of 275 lbs., with 350 lbs. being the max offered. The Sunny Health Pro Indoor Cycling Bike features a chain drive, but there is a belt drive version as well. Many of the models are available in a belt and a chain version. There is also an ASUNA designation on some models, which are the more commercial grade versions. If you need something more rugged and durable, check out those models as well. They do come with higher price tags though. What are the most popular bikes? As of our latest Sunny Health & Fitness Pro Indoor Cycling review, it was still the top selling model in the series, followed by the base Indoor Trainer model with chain drive, the B1002 belt drive, the B1423 belt drive and B1001 chain drive. So the model you are reading about on this page, called the SF-B901 for your reference, is the most popular indoor cycling that Sunny Health makes. Out of 28 models that is pretty impressive. You can see all of the top sellers on sale now at Amazon and read through all of the reviews to help you make a decision. The Sunny Health Pro Indoor Bike is perfect for those looking to get into shape, but not wanting to spend a ton of money to do so. For under $300 you get a very reliable, solid bike that will last you for years to come. It's not the fanciest bike we've ever seen, and is rather bare-bones, but it's perfectly fine for the casual user. If you want workout stats you can possibly rig a computer to it as some users have. But use it the way it is and put it in front of a TV and you'll be good to go. There are other Sunny Health models available as well, many with a belt drive if you prefer that. Remember that a belt drive will be quieter and require less maintenance than a chain drive, so that my be a better option for you. And if you need something more commercial grade, check out the company's ASUNA indoor exercise bikes.